The Magnuson Hotel Franklin Square Inn, a Magnuson Hotels Affiliate, is ideally located in the center of Houghton, Michigan, right next to the town's commercial center and just a few minutes' walk from a number of excellent dining and shopping venues, while the Houghton County Memorial Airport is just a short drive away. There are dozens of popular tourist attractions close to the Magnuson Hotel Franklin Square Inn, including the Isle Royale National Park, Mount Ripley ski area, Portage Lake, Quincy Mine Tours and the Dee Stadium. Further afield, but still within a short drive, notable attractions include the Keweenaw Research Center, Pavlova Wetlands Preserve, the Maasto Hiihto and Churning Rapids Nordic Ski Area, and of course, the McClain State Park on the shores of Lake Superior itself. 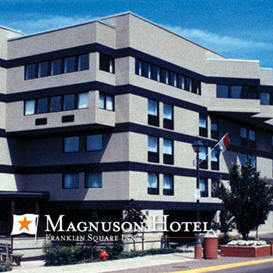 The Magnuson Hotel Franklin Square Inn affords its guests superb facilities and maximum comforts. Each room comes with a minimum of queen sized bed, free high-speed internet access, coffee maker, cable TV with extra stations, hair dryer, iron/board, free local calls, air conditioning, alarm clock, electronic door locks and wakeup service, while pets are also welcomed and the hotel provides courteous and friendly staff 24-hours a day. Amenities available on request include free parking for cars, trucks and recreational vehicles, a business and conference center with audio visual equipment, meeting suites, airport shuttle bus, fitness center, and laundry services. The AmericInn Lodge & Suites in Calumet, Michigan is centrally located on the beautiful Keweenaw Peninsula, and the Keweenaw National Historical Park and a block from Historic Downtown Calumet, Michigan. We are also 15 minutes away from the University twin cities of Houghton and Hancock. The AmericInn of Calumet is conveniently located right next to a ATV/Snowmobile Trail and we are just minutes from Swede Town cross country ski trails. Whether you are visiting our area for business or a family getaway let the AmericInn of Calumet hotel's friendly staff assist you in planning a perfect Northwood's getaway. Visit www.keweenaw.info/lodging/ to find more options.